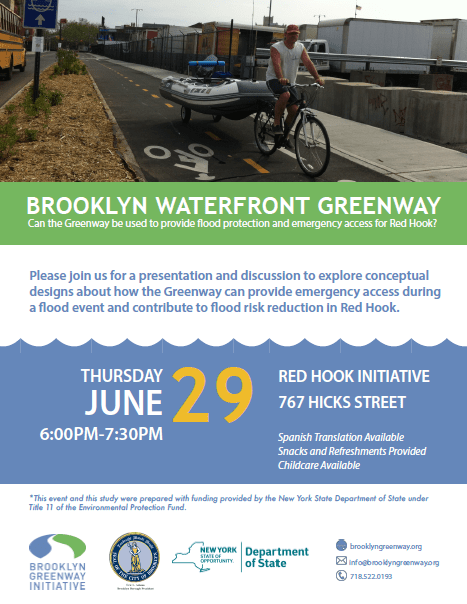 Brooklyn Greenway Initiative is exploring how the design and construction of the Brooklyn Waterfront Greenway in Red Hook and in Sunset Park can contribute to coastal resiliency and flood protection. BGI, the Office of Brooklyn Borough President Eric Adams and our consultant team led by Dewberry are exploring conceptual ideas and seek the input of residents and businesses about ways in which the greenway can be designed to be beneficial during flood events. Funding for these studies is provided by NYS Department of State under Title 11 of the NYS Environmental Protection Fund.